World Salt Awareness Week 2012 was held from 26th March - 1st April and focused on the role of salt reduction in preventing stroke. 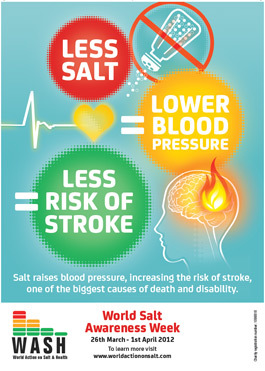 Salt reduction and stroke prevention has been selected as the topic for World Salt Awareness Week (WSAW) 2012 because salt is the major factor that raises blood pressure and high blood pressure is the single most important risk factor for stroke. Worldwide 3 million women and 2.5 million men die from stroke every year. Stroke is the third most common cause of death in developed countries. Evidence also suggests that a high salt intake has a direct, independent effect on stroke. Salt is therefore responsible for many of the incidences of stroke. Reducing average salt intake by just 1g/day can prevent thousands of deaths from stroke every year, plus the additional thousands of events that do not result in death. Twenty nine countries took part in the 5th annual Salt Awareness Week, including Australia, Bangladesh, Cameroon, The Healthy Caribbean Coalition, the Pan American Health Organisation, Sweden and the Netherlands. If you were involved I would be delighted to hear how activities went.